PopPopMan.co.uk - modern toys to get steamed up about! Modern toys to get steamed up about! The average man in the street probably equates the German city of Nuremberg with the war crimes trials, held there between 1945 and 1949. However the readers of "STEAM" are far from average, and, given a few clues like Doll, Bing, Fleischmann and Plank, they might well shout eureka, after suddenly remembering that all these great companies, who made steam toys of quality, were based in the aforementioned Bavarian City. Thirty years ago, like a phoenix rising from the ashes, a new Nuremberg based tin toy manufacturer came into being. Established in 1977 by Elisabeth Walther and Bernhard Tucher, the firm of Tucher & Walther brought back to the city, which was once the toy capital of the world, a firm which exemplified all the qualities of the Nuremberg toy making tradition. 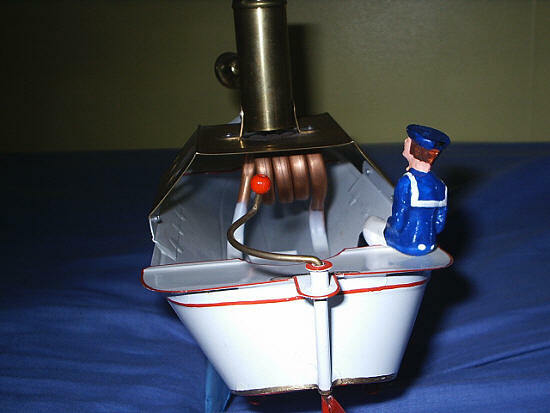 For the first couple of years, Elisabeth & Bernhard, repaired and sold locally made tin toys gleaned from Nuremberg's past. By 1979 they decided to sell, not only antique toys, but to manufacture new ones, to their own designs. 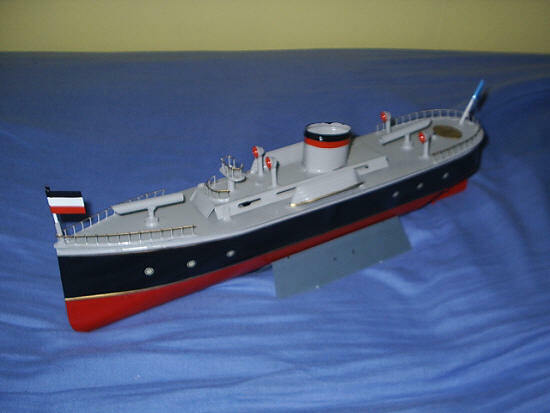 Thus began a range of limited edition, tinplate toys of quality, which continue to this day. All the toys are handmade and editions are limited to between 50 and 1,000 pieces, depending on design. Each year Bernhard introduces about 10 new toys to the world. 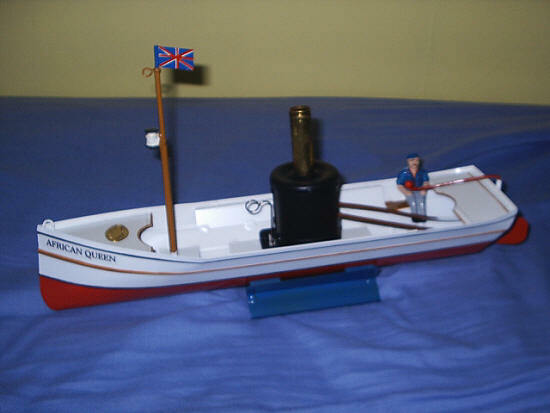 My own particular interest, pop pop boats, is catered for in the vast range of items manufactured, which also include those powered by steam & clockwork, plus a vast range of steam driven accessories. 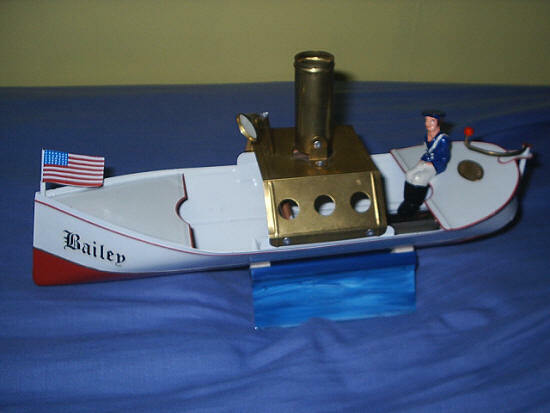 The splendid "Bailey Skiff" (T207), a superb example of a horizontal coil driven pop pop boat. 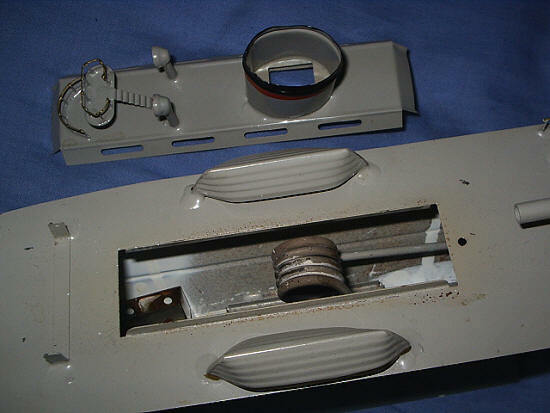 View from the stern showing the propulsion coil. "Torpedo Boat" (T376). This example dates from 1999. The long tradition of Nuremberg was the inspiration for this modern day toy firm, which, by 1991 had outgrown its premises and moved to a modern purpose built factory 20 miles from the city. Long may Tucher & Walther produce quality items for us STEAM enthusiasts to enjoy, inspired by the amazing heritage of items produced in Nuremberg from the 1880's to the 1930's.